My iPod is in recovery and DFU mode. I need help getting it out of both. I can't get it out on iTunes or by entering DFU. HELP ME!!!... Make sure your iTunes is updated to the most recent version. Assuming the recovery mode screen is showing (iTunes logo with the lightning cable), connect your iPod to iTunes and select "Restore iPod" on the summary page or if prompted. 29/01/2013 · Exit Recovery mode on iPhone, iPad and iPod Touch without the need to restore Works even if you do not have a jailbreak FIX infinite boot loop (bricked iOS d... what causes hair fall and how to prevent it If your iPod crashes all of a sudden, the recovery mode may turn out to be of use. If you find the Apple logo on your iPod and it doesn't progresses further, the recovery mode will have to be used. If iTunes doesn't recognize your device and states that it is in recovery mode, you need to configure it. If you have no idea how to tackle these problems, try iPhone Data Recovery, which can help you successfully get iPhone out of recovery mode. All in all, there is always a suitable method for you to put iPhone, iPad, iPod touch in recovery mode. how to get the smokes in south park If your iPod crashes all of a sudden, the recovery mode may turn out to be of use. If you find the Apple logo on your iPod and it doesn't progresses further, the recovery mode will have to be used. If iTunes doesn't recognize your device and states that it is in recovery mode, you need to configure it. Sometimes, while working with your iPod for unknown reasons your iPod may enter into recovery mode. For instance, whenever you try to restore a backup or after an update to a fresh firmware etc. your iPod may get stuck in recovery mode. My iPod is in recovery and DFU mode. I need help getting it out of both. I can't get it out on iTunes or by entering DFU. HELP ME!!! Make sure your iTunes is updated to the most recent version. 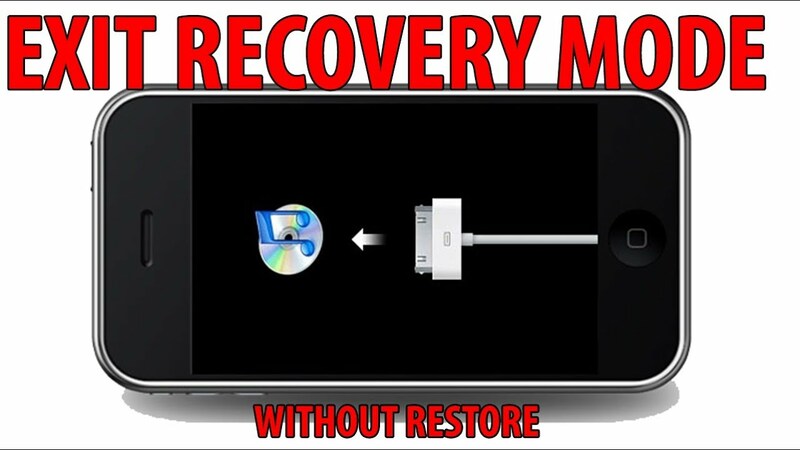 Assuming the recovery mode screen is showing (iTunes logo with the lightning cable), connect your iPod to iTunes and select "Restore iPod" on the summary page or if prompted.